I love to grow vegetables. 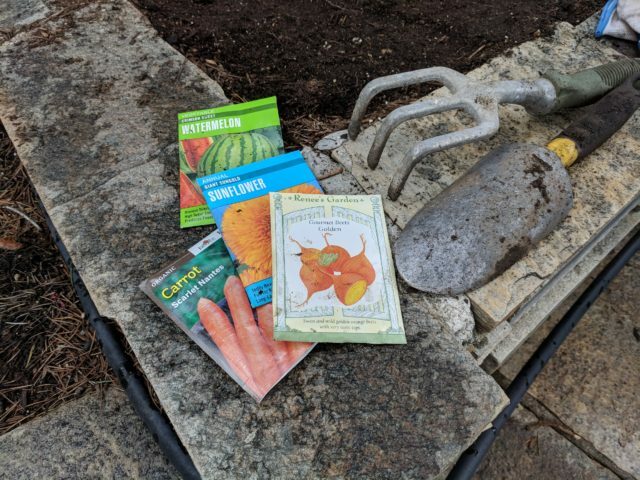 I’m not necessarily good at it, but I get a lot of satisfaction from planning, preparing and planting the seeds and seedlings at the start of the growing season and then watching them grow over the summer. Back home, that whole exercise lasted approximately five to six months, tops. 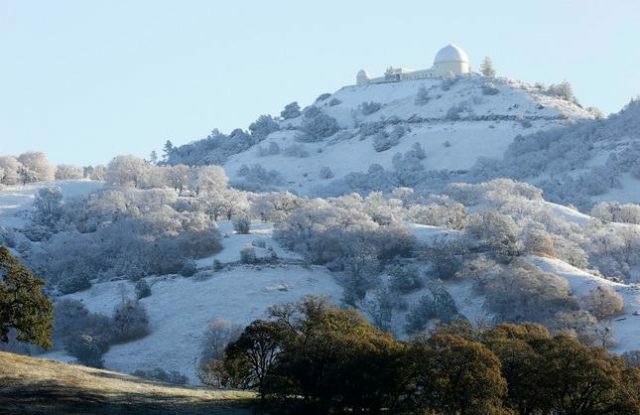 Here in Northern California the growing season never starts and stops. In fact, they have a saying here that there are only two seasons here: brown and green. Fresh produce can be found in farmers’ fields, farmers’ markets and grocery stores year-round. There are certain times that are better than others to grow what might be referred to as “cold weather” crops and “hot weather” crops. Consider that in Toronto, Zone 5, cold weather crops constitute planting and harvesting lettuce, peas and radishes in early summer and warm weather crops like tomatoes, peppers and cucumbers are harvested during and after the heat of the summer, followed by root vegetables and squash as we move into Fall. I think the same is true for Northern California, except the calendar starts a lot earlier–like, 2 months earlier–and you don’t ever stop planting–you can keep planting and growing vegetables, you just have to know what grows when in this zone, which happens to be Zone 10. According to plantmaps.com, the first frost shows up around the beginning of December and the last frost is around the end of February. That’s a full 10 MONTHS of growing!!! Many people here have fruit and even nut trees in their gardens–orange, lemon, lime, cherry, apricot, prune, grape vines, walnuts, even pomegranates. 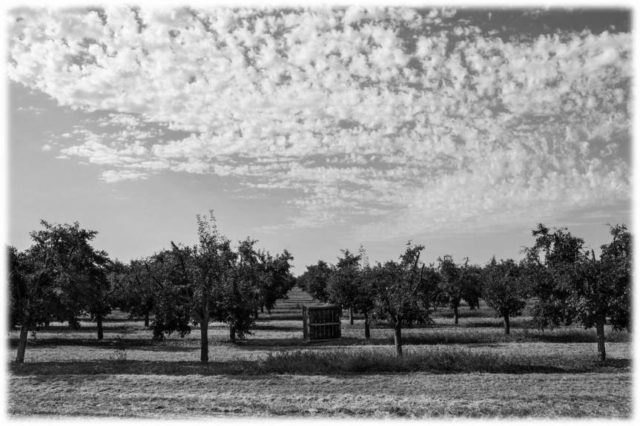 In fact, before this valley was turned into a bedroom community and tech hub it was covered in acres and acres of fruit orchards. I did the stereotypical thing and bought an orange tree within weeks of moving here. Even the woman at the nursery knew it–she said the firs thing people do when they first move here from a cold climate is buy a fruit tree. I guess I’m that predictable. It’s a dwarf navel orange variety, which means I can keep it in a giant planter. Next I took out some books from the library on gardening in California and planting a container garden. They were good inspiration and helped me reel in my romantic images of a garden straight out of a Nancy Meyers movie set. I decided to buy a bunch of light-weight containers, some cheap plastic ones, and a few more expensive resin ones. What’s the difference, other than the price point, you ask? They are both plastic, but true plastic is fairly flimsy and cracks easily, as I learned when one of them fell out of my car right after I bought it. The resin ones I got are a moulded plastic, equally light weight, but they seem to be a little more durable and sturdy. I made sure all of the pots had drainage holes in the bottom. 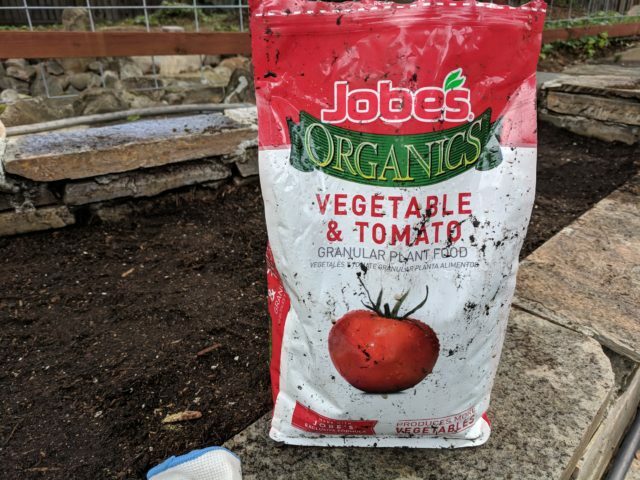 I also bought a few large bags of raised garden bed and planter mix, but it didn’t appear to have much if any soil in it. So I went back to the garden centre and asked. I was on the right track but needed to amend the mix with potting soil. The helpful garden centre guy also recommended using some vegetable fertilizer. Boy did it stink something fierce! I added a small amount to the soil and mix combo before putting the plants in. I left the bag outside by my tools only to discover that some animal (possibly the four-legged one that lives in our house) got into it, and spilled its contents on the ground. It is so ferociously malodorous, I can’t imagine anyone or anything, enjoying something that smelly. 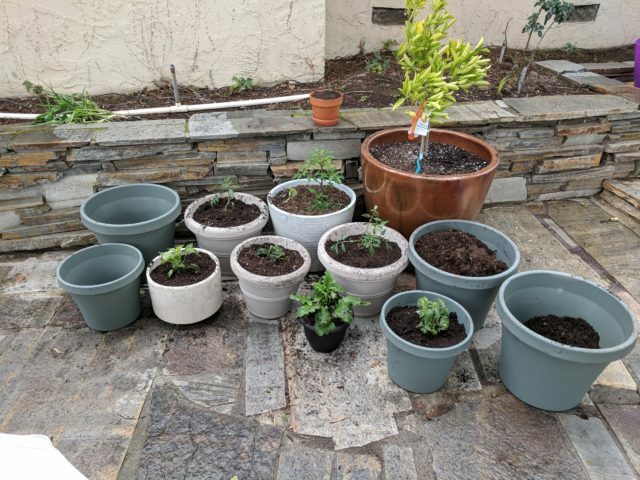 I know I might have gotten too ambitious with my plants, but since I don’t really have a garden to call my own here, I figured I could handle about a dozen pots. Oh! And lil guy picked out a gerbera daisy, so we got one of those too. I still have three pots laying fallow waiting to see which kind of vegetable they will host. I wish I could grow sugar snap peas, but I fear I might be a little late starting them now because soon it will get hot and there will definitely be no rain. Lil guy also picked out sugar baby watermelon seeds, but there really is no garden to speak of with lots of sunshine where a vine like that could grow. The entire backyard, while large is mostly hardscaped or covered in ivy and tall trees that throw a lot of shade. I’ve got my eye on one spot on the north side of the house that seems to get continuous sun throughout the day. It would make a good spot for a raised bed, but it’s super close to the house, which is probably not a good thing–someone told me there are things called fruit rats here and I don’t want to have any close encounters with those. So here are some photos of my work-in-progress container garden (and one little bed). It looks a little sad right now, but once the foliage fills out, I think it will look pretty darn good, and those veggies are going to taste delicious! My little container garden collection–and orange tree. Fresh cut flowers are one of the simplest ways to remind yourself there’s life after winter. But if they aren’t in the budget, what about a flowering plant? It’s the gift that keeps on giving–if you have a green thumb. I can’t say I’ve ever had much luck growing flowering plants at home. I never know how much water to give them, if they should or shouldn’t be in direct sunlight. Plant food, what’s that? Call it beginner’s luck, but I’m pleased to say I brought my wee Christmas Cactus back from the brink. I bought it at Ikea months ago. It was blossoming then, but within a week or two of bringing it home it stopped thriving. Kind of reminds me of the beta fish my son got for his birthday a couple of years ago. Apparently more fish food does not make for a healthier fish. The cactus looked like it was on death’s doorstep when I moved it to the window sill in my laundry room. It found company with my three phalaenopsis orchids (which I also brought back from the brink, but that’s another story). Maybe it was the company, maybe it was the window sill, I really don’t know. But it began to grow new buds and that alone made me giddy. This plant reminds me of my paternal grandmother, Lily. She adored these plants and the colour pink. I don’t think I ever saw her without pink lipstick on except at her sickest. She died far too young at the age of 69. I was 18. She was a stylish lady who loved to doll herself up. She could cook a wicked Hungarian meal and that included sinfully delicious desserts. And her home always had flowering plants. African violets and Christmas cacti come to mind. 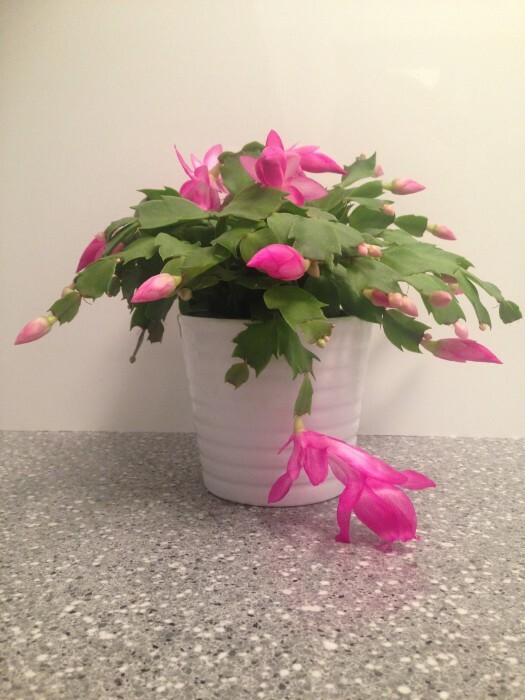 So on this snowy, wintry day–less than a month away from what would have been my grandmother’s 92nd birthday–enjoy the colourful blooms of my Christmas cactus to brighten up your day. Who knows? You might be inspired to nurture a flowering plant too!